LankaBangla Finance Ltd (LBFL) recently signed MOU with paprii.com for its customer privilege. Md. Minhaz Uddin, Head of Cards of LBF and Kazi Fouzia Hossain, CEO and Co-Founder of paprii.com signed the MOU for their respective organizations. Under this MOU, LBF Cardmember will enjoy 15% discount (round the year) and for this Valentine’s Day cardmember will enjoy 20% discount till 28th February from paprii.com for any e-commerce transaction. Khaja Wasiullah, Head of Sales & Merchant Relationship, Md. Abdul Jalil khan, Principal Officer, Merchant Business, Md. 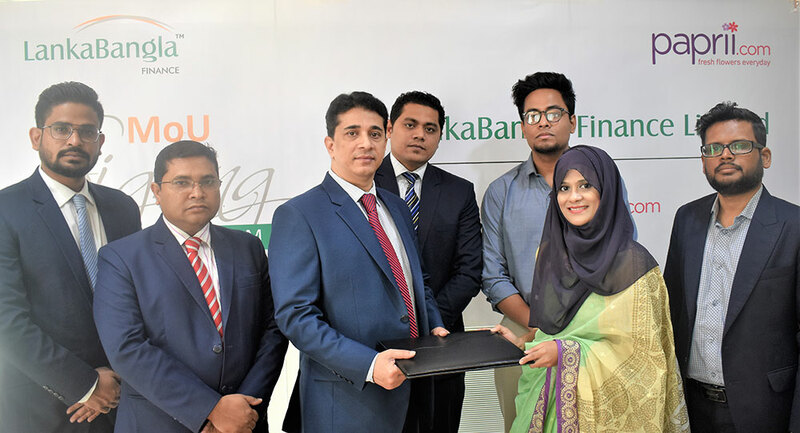 Shafiqul Hasan, Senior Officer, Merchant Business of LBF and Nazmus Sakib, Chief Financial Officer of paprii.com and other officials of both organizations were present at the signing ceremony.